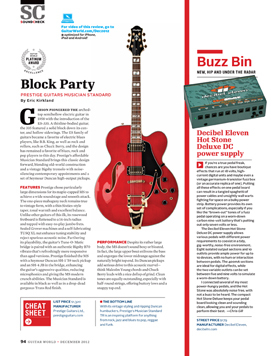 Block Party - Musician Standard Review in Guitar World - Prestige Guitars Ltd.
GIBSON PIONEERED The archedtop semihollow electric guitar in 1958 with the introduction of the ES-335. A thinline-bodied guitar, the 335 featured a solid block down its center, and hollow sidewings. The ES family of guitars became a favorite of electric blues players, like B.B. King, as well as rock and rollers, such as Chuck Berry, and the design has remained a favorite of blues, rock and pop players to this day. Prestige’s affordable Musician Standard brings this classic design forward, blending old-world construction and a vintage Bigsby tremolo with noise silencing contemporary appointments and a set of Seymour Duncan high-output pickups. Prestige chose particularly large dimensions for its maple-capped MS to achieve a wide soundstage and smooth attack. The one-piece mahogany neck remains true to vintage form, with a thin Sixties-style taper, tonal warmth and excellent balance. Unlike other guitars of this ilk, its rosewood fretboard is flattened to a 14-inch radius and topped with easy-to-play jumbo frets. Sealed Grover machines and a self-lubricating TUSQ XL nut enhance tuning stability and reject spurious acoustic noise. Furthering its playability, the guitar’s Tune-O-Matic bridge is paired with an authentic Bigsby B70 vibrato that’s refreshingly more responsive than aged versions. Prestige finished the MS with a Seymour Duncan SH-1 ’59 neck pickup and an SH-4 JB in the bridge, enhancing the guitar’s aggressive qualities, reducing microphonics and giving the MS modern crunch abilities. The Musician Standard is available in black as well as in a drop-dead gorgeous Trans Red finish. Despite its rather large body, the MS doesn’t sound boxy or bloated. In fact, the large upper bout enlivens the bass and engorges the lower midrange against the naturally bright top end. Its Duncan pickups add serious drive to this acoustic marvelthink Malcolm Young chords and Chuck Berry leads with a nice dollop of grind. Clean tones are equally outstanding, especially with half-round strings, offering buttery lows and a snappy top end. The Seymour Duncans on a vintage archedtop seems like a great combo. I’ve always liked the semi-hollows — really versatile guitars.